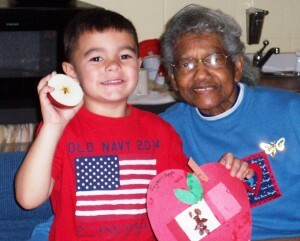 Some of our children at Gates visited our Grandmas and Grandpas last week, and apples were on the agenda. They discussed the different varieties of apples and their health benefits. They read the story, “The little Red House with No Doors and No Windows,” which tells the tale of a little boy and his search for a “house” which also has a star inside. We also learned that when an apple is cut in half, a star is revealed! Each summer our Child Care Camp puts on the Krazy Kids Karnival! Each location designs, builds, works and then plays the carnival games. Our Edler Care program also gets involved and this year enjoyed a picnic lunch with our kids and watched each centers perform at the annual “all camp” Talent Show. They also got busy putting together all the prize bags for the children. The “photo booth” is always a huge hit! 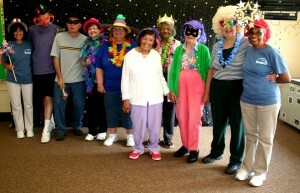 The kids and seniors dressed up in crazy hats and masks and use props to create one-of-a-kind fun-filled photos! What a fantastic event it is every year! May is Older Americans Month, and one of our many celebrations this month included recognizing the value of meaningful social interaction between our older and younger generations. 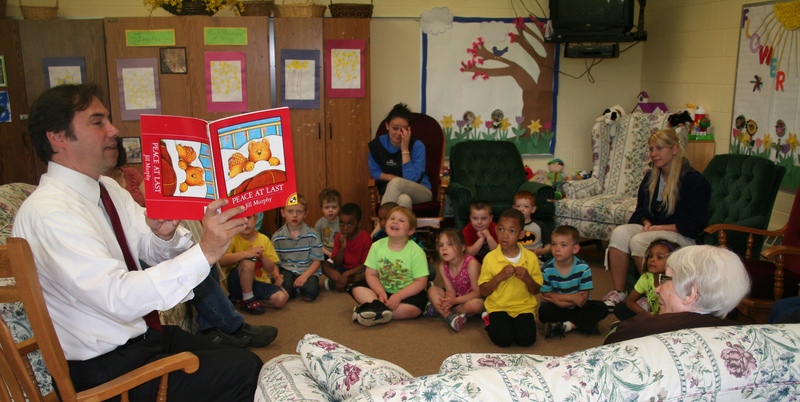 For our Inter-generational celebration, we invited Gates Town Supervisor, Mark Assini, to join in by reading to our grandmas, grandpas, and children. He amused us all by singing and acting out the Spiderman song! Later in the day, the Gates-Chili Jazz Ensemble entertained us with several tunes that had the kids up and dancing and the seniors smiling from ear to ear! We also celebrated this month with an ice cream social and today we are focusing on health and fitness. Lots of fun, exciting things happening this month! 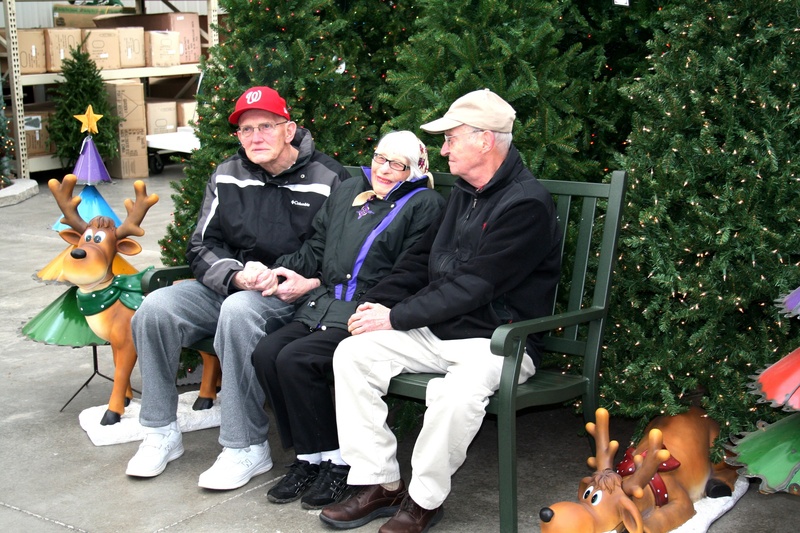 Every year our Elder Care participants take a trip to a local farm store, The Garden Factory, to view the beautiful holiday Pointsettia flowers and the amazing toy train exhibit. The Pre-K class from St. Mike’s joined them this year and had a wonderful time with the grandmas and grandpas! We had a small dedication ceremony with our “grandmas and grandpas” and their families. 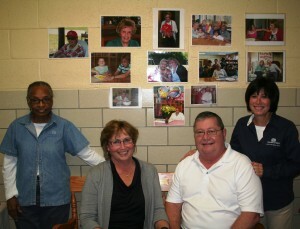 The photos show Donna Delvecchio, Elder Care Coordinator, Mae Evans, who works with Donna, and Chris and Jack Long, Lu’s daughter and son-in-law. Many thanks to Grandma Lu’s family for the generous gift. What is Social Adult Day Care? New York State defines Social adult day care programs as those offering “a structured, comprehensive program which provides functionally impaired individuals with socialization; supervision and monitoring; personal care; and nutrition in a protective setting during any part of the day, but for less than 24 hours”. 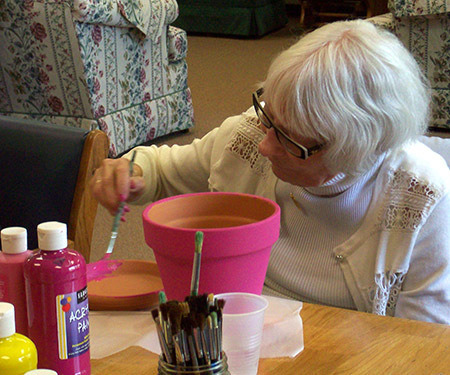 Our innovative program offers a safe environment where Generations strives to meet the needs of Seniors and Caregivers. We aim to foster new peer friendships, help participants find interests and skills they never knew they had and help them to maintain a healthy meaningful lifestyle.